Several gowns in the collection at the Tudor Dress: A Portfolio of Images site show a white band running over the shoulder and down the side of the bodice. What is it? I've received many messages related to this band with several ideas as to what it could be. This page represents an attempt to collect and discuss those ideas. In all cases, the answers I provide are strictly speculation on my part. To date I have found no definitive evidence on this question. 1) The band is actually not a band, but a bit of chemise or undergown showing through an opening in the bodice. There are two difficulties with this conclusion, one relating to the general construction of English gowns of this time period, the other ralating to the visual evidence. 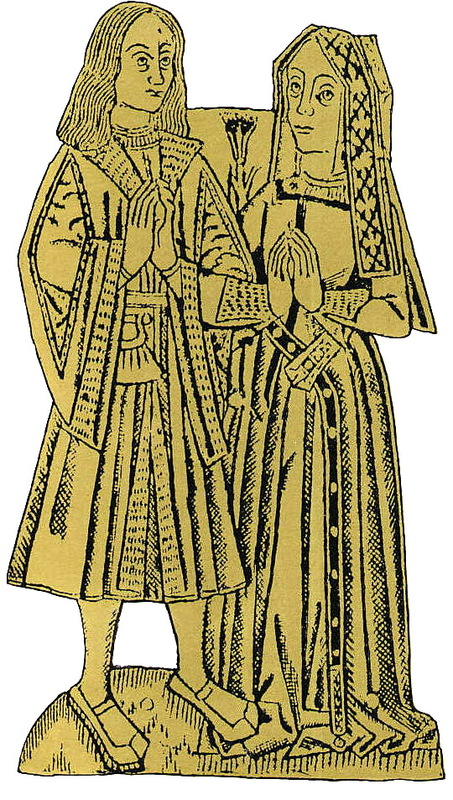 If we look at English images from the turn of the 15th/16th century, as depicted in monumental brasses, we see gowns similar to the Flemish gowns. As the century begins, the gowns transition from vertical to horizontal in general shape, with necklines becoming square, waistlines lowering and skirts becoming more full, but they retain the fitted set in sleeve. (ex. http://www.uvm.edu/~hag/sca/tudor/trivick02.jpg , http://www.uvm.edu/~hag/sca/tudor/trivick04.jpg ). Even when the sleeve becomes more full and bells at the end, the sleevehead remains set-in (ex. 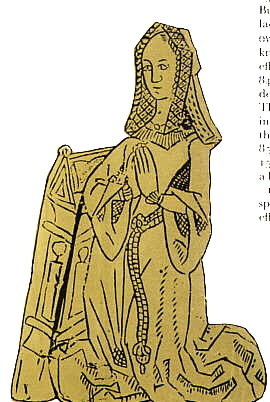 http://www.uvm.edu/~hag/sca/tudor/trivick03.jpg ). Thus, the general construction of gowns in England at this time appears to be that of a fitted bodice, with the waist indentation occuring at the natural waistline (even in gowns that are clearly not seamed at the waist), with set-in sleeves. That is, no gap at the armscye for a chemise to show through. And what of the pictorial evidence? 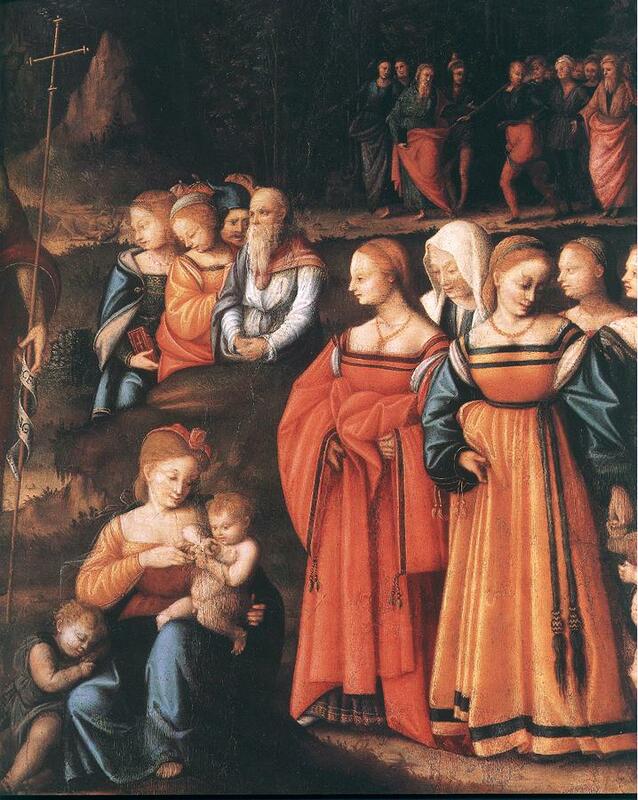 The first image at the site that shows the band is that of Catherine of Aragon painted c. 1525 ( http://www.uvm.edu/~hag/sca/tudor/cathyold1.jpg ). 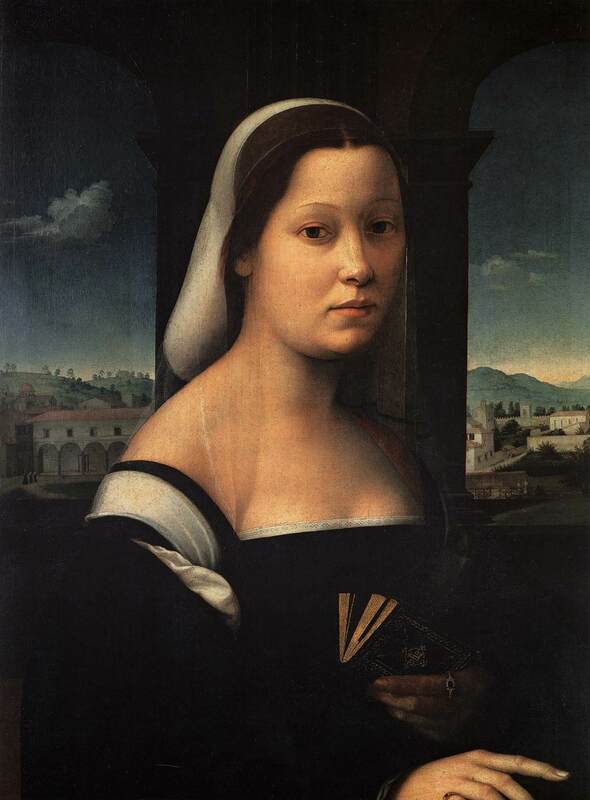 While the artist is not excessively skilled at showing detail, it does appear that the band is flat, rather taut, passes completely over the shoulders and along the side bodice, and may be slightly covering a portion of a jewel at her neckline. 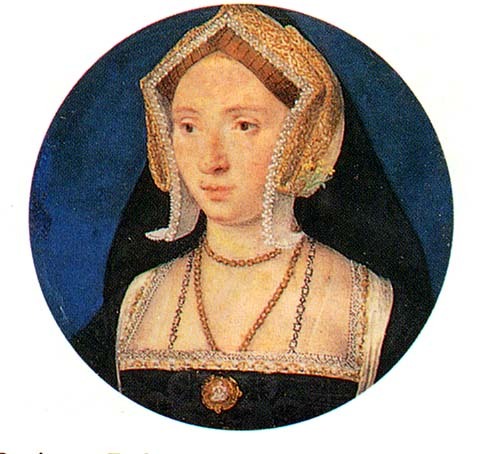 The miniature of Anne Boleyn is similar ( http://www.uvm.edu/~hag/sca/tudor/boleyn1525.jpg ). The band is flat, taut (as evidenced by the slight vertical puckering or folds), etc. 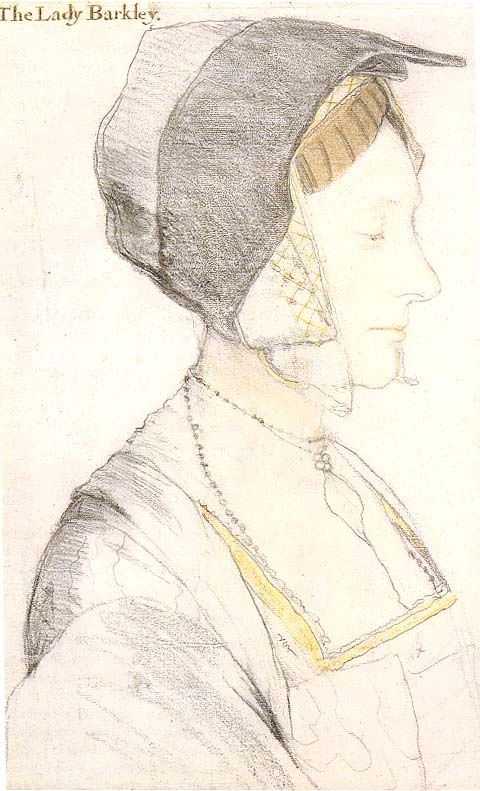 The sketches by Holbein of Elizabeth Dauncy ( http://www.uvm.edu/~hag/sca/tudor/dauncey.jpg ) and Margaret Grigg ( http://www.uvm.edu/~hag/sca/tudor/holb5.jpg ) are the most intriguing. The band is quite clear, quite flat, passes over the shoulder and ends, in the case of Margaret Grigg, with no seam or opening at its end. In fact, it appears to be pinned onto the gown in several places. In both cases, the sleevehead is quite fitted, set-in, there is a shoulder seam on the gown, and the band is far enough from the armscye to see that it is not a bit of fabric peeping through an armscye seam or opening. Other images are less clear, but in all cases it would be hard to create a bodice that is both so well fitted yet has a large enough opening to allow that amount of chemise to pull through when such a fitted sleeve and small armscye is evident. 2) The band is the lining of a ropa, or overgown, or the lining of a collar of a ropa. That is, the ropa is open and the collar turned back. This is the judgment of one representative of the National Gallery. But there are some difficulties with this conclusion as well. 3) The band is part of a harness for holding up the voluminous skirts. 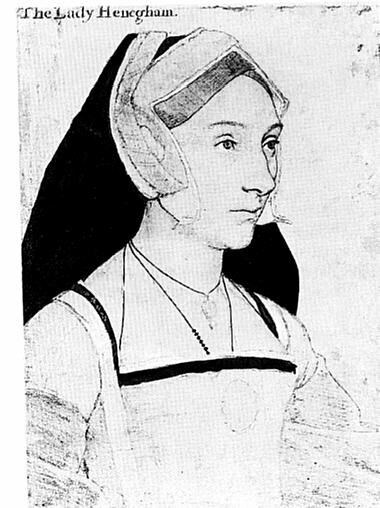 Evidence for this seems to rest on one image: Holbein's sketch of an English Burgher's Wife ( http://www.uvm.edu/~hag/sca/tudor/english.jpg). 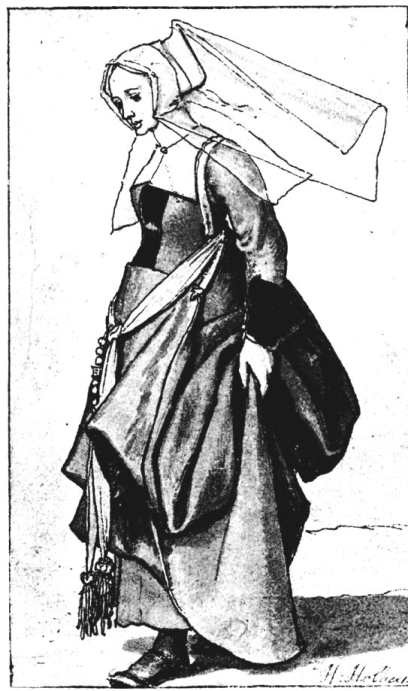 Unfortunately, in this tiny sketch (the original is about the size of a postage stamp) it is unclear if the white band and skirt harness are in any way connected. In fact, they don't seem to be whether in the sketch or in their effect on the way the folds of the skirt fall. 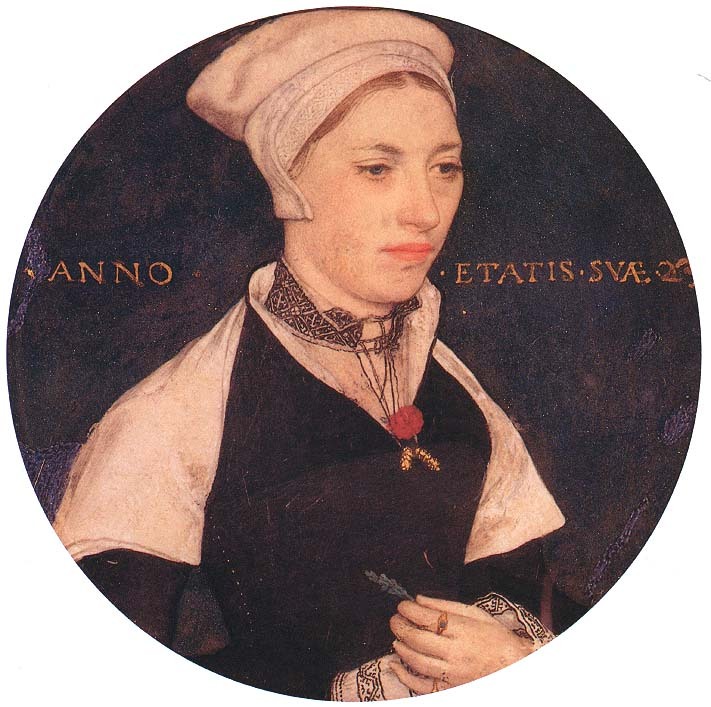 In the other full length view we have of a white band, the Holbein skletch of the More family, Elizabeth Dauncey's gown has no train. "In illustrations where the back can be seen, the 1490's collar is treated in two different ways. Either it goes down to a point, reaching to the top of the belt, and presumably covers the lacing. Or, it is in two pieces, one on each side of the 'V' neck of the bodice, showing the exposed centre back lacing. 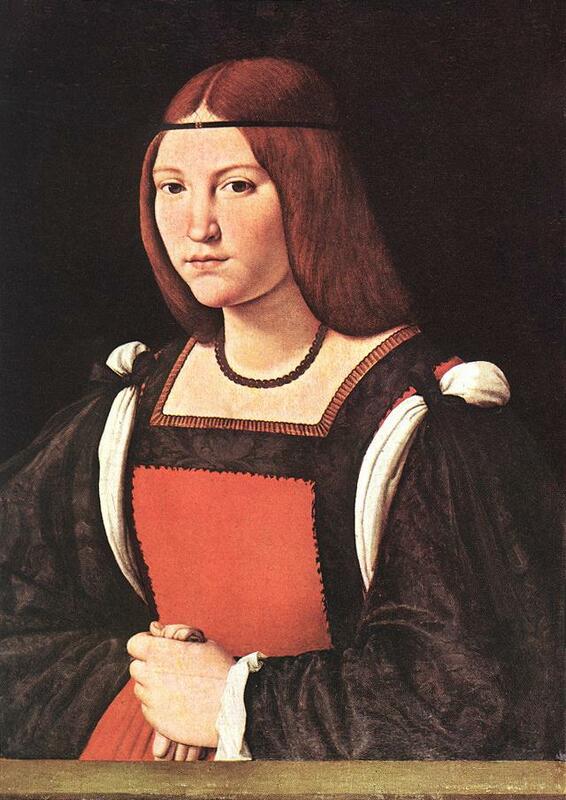 These strips of collar could be the forerunners of the residual white strips seen in early Tudor portraits such as that of Catharine of Aragon." She does not speculate on how they would be constructed, why they would have remained, what use they serve, etc. 4) The band is a stabalizing element to keep strain of close fitting off the expensive, fragile main fabric. 5) The band is a separate piece of fabric, attached to the back and brought over the shoulders and pinned to the bodice front to provide a place to pin a shawl in such a way that it will not harm the fashion fabric. 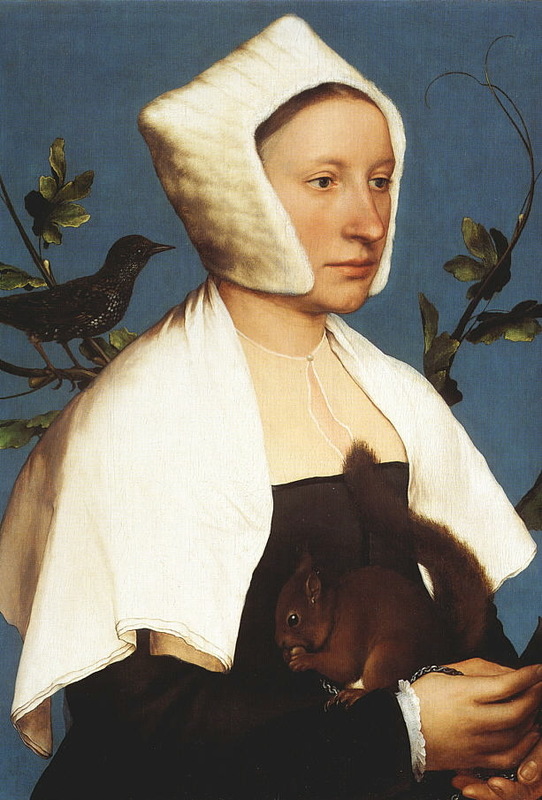 There are several examples of women wearing shawls of folded fabric that appear to be pinned in place. 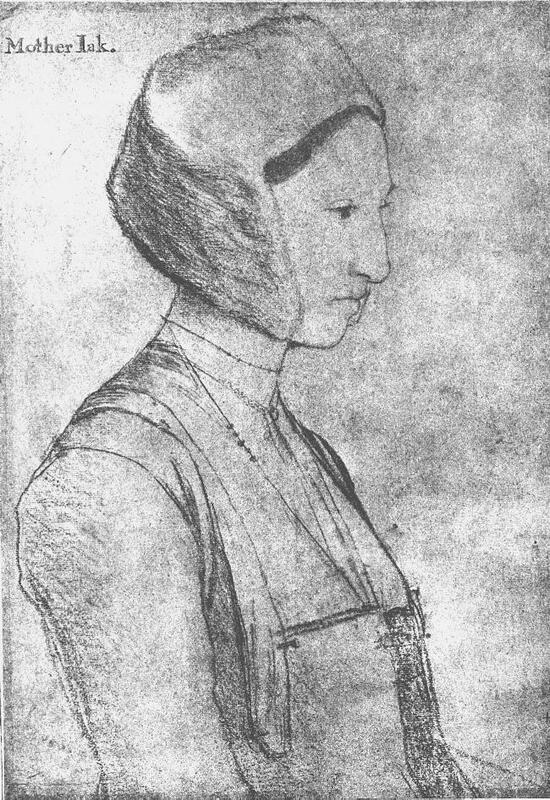 ( http://www.uvm.edu/~hag/sca/tudor/holb-fam.jpg , http://www.uvm.edu/~hag/sca/tudor/pemberton.jpg , http://www.uvm.edu/~hag/sca/tudor/holbsq.jpg ) all by Holbein. In each case, the shawl appears to be pinned directly to the gown high up on the bodice, with no evidence of the white band appearing below the shawl. In the case of Mrs. Pemberton , the shawl is depicted as quite high, well above the bodice side where the band appears on the other gowns. 6) The band is not part of a harness as descibed in #3 above but is used to hold up the skirt. 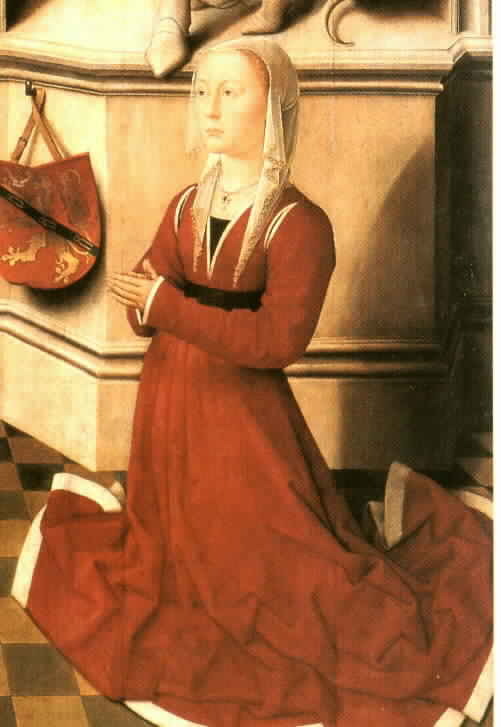 Holbein may have painted the harness because it was an unusual way to hold up the skirt. The usual way may have been to pin the skirt to the band. Thus, in the paintings/drawings where the skirt is let down, the band appears to do nothing. In the images where the skirt is pinned up, the lower part of the band is obscured by the pins or by the sleeves. Because of the weight of the skirt, the band would have to pass over the shoulder and be sturdily affixed in the back. Thus, in the Holbein back view sketch, the bands might be sewn into the back closing, providing a sort of placket for the hidden lacing as well as being solidly attached. 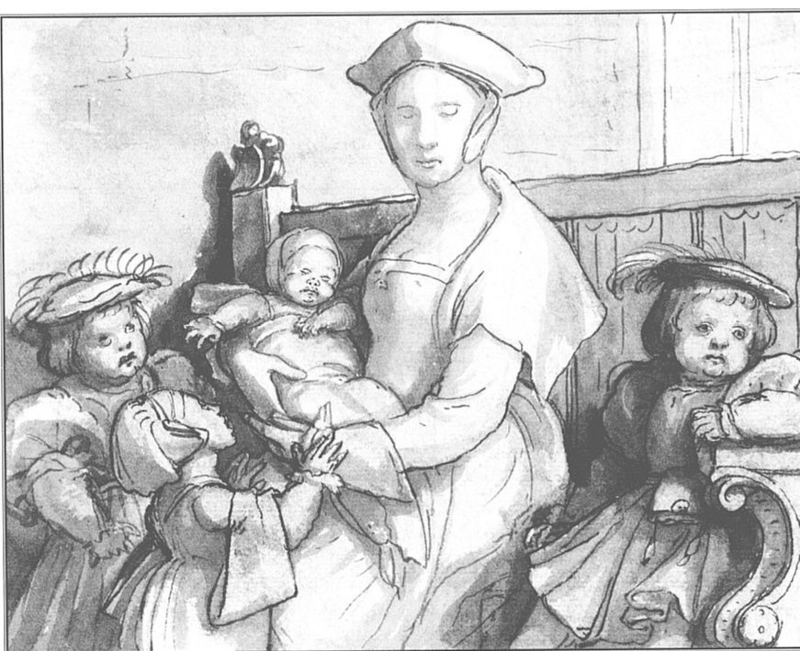 In the Holbein More family sketch, the figure of Margaret (leaning over with book) has her skirt tucked up quite high (as high as the bands?) but it is hidden by her sleeves. 7) The band is a separate piece of fabric, attached to the back and brought over the shoulders and pinned to the bodice front for absolutely mysterious and unfathomable reasons. I'm beginning to think this must be the correct answer! Interestingly, I just re-watched the 1970s BBC production of the Six Wives of Henry VIII. The costumes recreations are rather dated now (and far too much hair!) 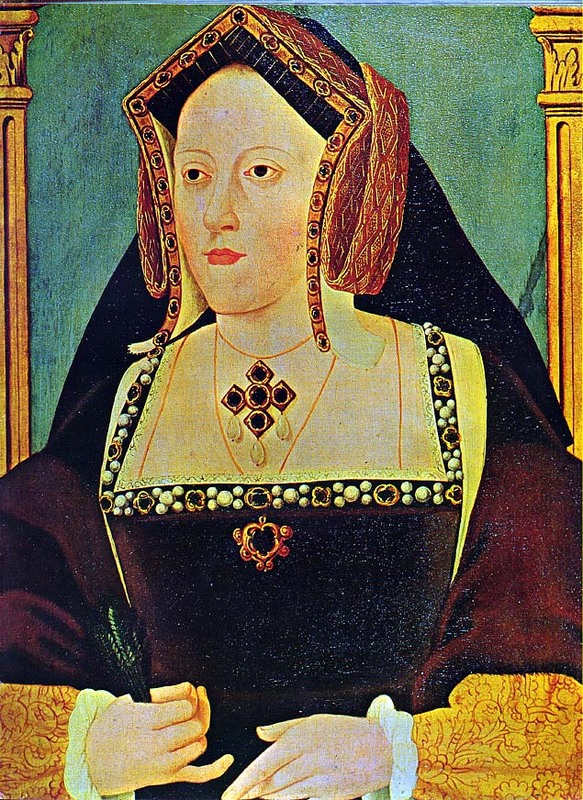 but in a scene of Jane Seymour at home prior to her marriage they did a recreation of the Holbein "English Burgher's wife" gown complete with flying headdress and white band. Apparently they didn't know what to do with it either. There it is, across the shoulder, stitched down in this case, but with no apprent purpose!